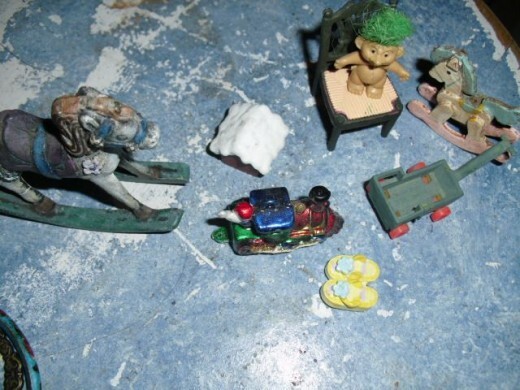 When I was a kid, I didn't necessarily make a lot of miniatures. I appropriated them. I observed that rectangular magnets removed from the refrigerator and turned onto their underside looked like pans of brownies. 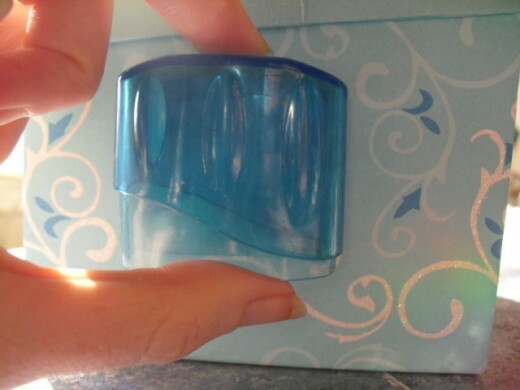 Domed pencil sharpeners could make a passable pet carrier. The pegs from a Lite Brite set could masquerade as bottled beverages and (inspired by Stuart Little) be referred to as 'sarsaparilla'. About the time I graduated from college, I discovered a book called Making Dolls' House Furniture by Patricia King. 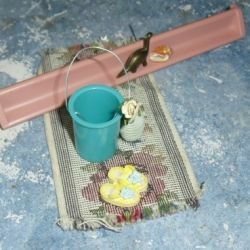 Here was a woman making dollhouse furnishings from random little household objects -- and showing them at shows. I discovered that miniatures were not solely for 1) children or 2) the bourgeois. 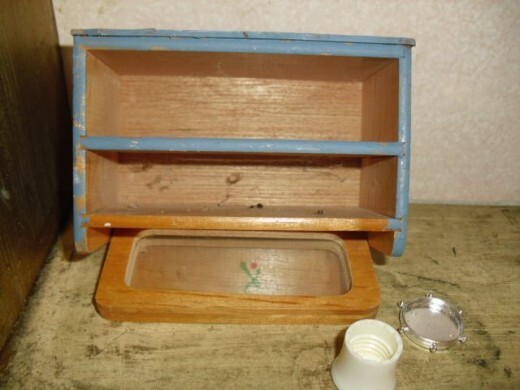 Soon after, I made a miniature shelf from a piece of molding from a broken picture frame. I stuck it to the wall above my real-life shelf. I put some items on it and under it. I made the beginnings of a little room there on my shelf. The old wood jewelry box was given to me by my aunt when I was still a child. It served as a miniature chest of drawers, or bureau. Many years later, I got the idea of placing it backwards and upside-down and turning into a kitchen counter. I painted it to match the kitchen items I had, and glued tiny glass tiles to what is now the top. It fit perfectly into the space I wanted it. 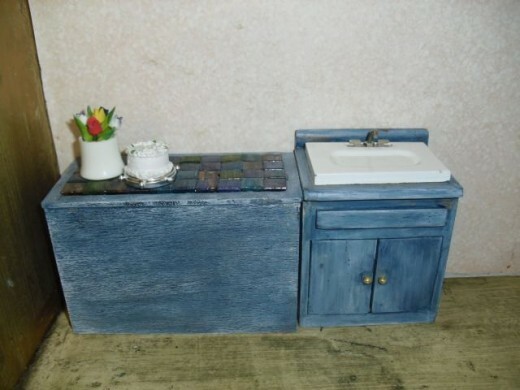 Here is the miniature cabinet in its current incarnation, sporting an antiqued blue finish. Here is a peak behind the scenes. Miniature tiles can be handy for turning things like wooden blocks and jewelry boxes into counters and architectural details. This looks like the brand I have. They're easy to work with. You can glue them right side up or upside down to create different looks. Mount Rainier Primary -- a very tiny school -- is in a bit of disarray at the moment. But here are a couple of the furnishings. Some of the items, you might guess, are cut from a teaching catalog. 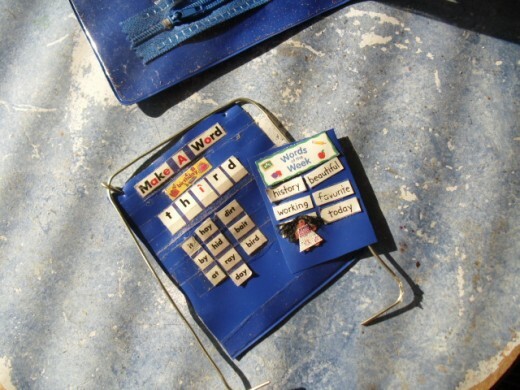 The blue plastic on the pocket charts was cut from a slightly crumpled three-ring pencil holder. (You can see it in the background). The covering on this miniature bed may qualify, on two accounts, as a miniature made from recycled items. I made the quilt square, but it wasn't intended as a covering for a dollhouse bed. I was planning on making a quilt. That was a lot of years ago! 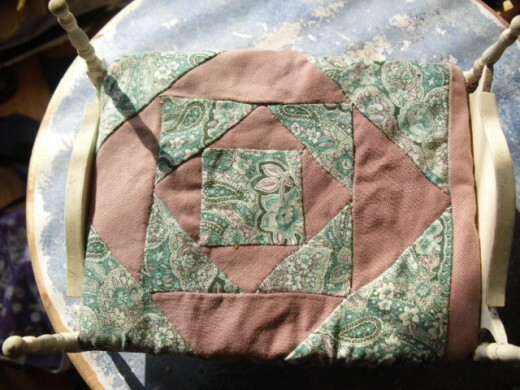 The quilt didn't happen, but the quilt block found a home. The floral material was bought. 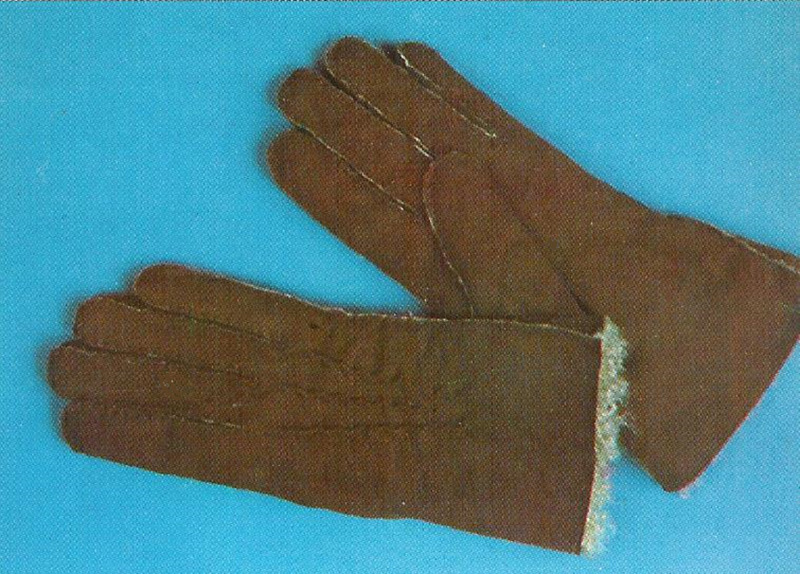 The solid dusty rose fabric, though, was cut from a pair of pants. The pants had tapestry belt buckle loops -- the makings of miniature pillows. A couple thoughts: 1) People are apt to like the book better if it's the thing they are actually looking for. The title doesn't necessarily clue you in to what you'll find inside. These aren't furnishings that fit in a modern house. They're mostly Victorian -- and a rather over-the-top Victorian at that! They aren't photo-realistic, but they are realistic enough for people to ooh and aah and be confounded you made it. If this isn't the era, or look, you're going for, you probably won't actually carry out the step-by-step projects. I didn't -- but I did learn a lot from it. One lesson was to look beyond the surface color -- if you stick a lot of unrelated objects together and then paint them, they're more likely to look like they belong together. Bathroom items aren't so readily available in the dollar store -- so this book may prove inspiring.! Here is a look at some of the things that can be promising for making recycled miniatures. Some are found objects. I have had that too-big cloisonne bracelet for years, and haven't managed to find or fashion anything the right size and shape to make a table. A friend gave me an idea. He is using pourable varnish to make decorative tiles to display pressed flowers. A miniature tabletop could easily be created by pouring. 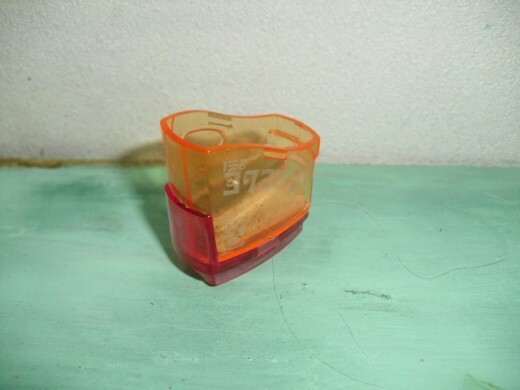 About some of the other items: Miniaturists generally tell people to save jewelry findings, but they seldom mention pencil sharpener components. Is it because fewer people have them? Pencil sharpeners come in some nifty shapes. The one makes me think of a small kitchen appliance like a bread machine. It would have to be repainted, of course. Unfortunately, it's too big for 1:12 scale, and my nieces don't have Barbies. 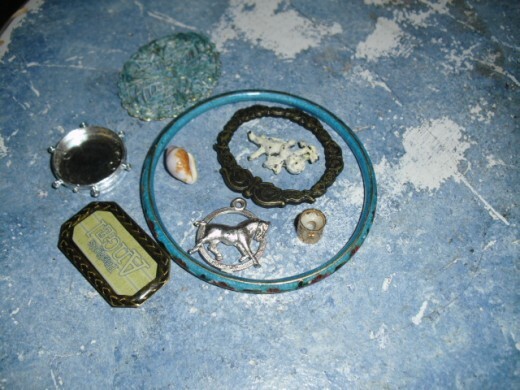 Here is traditional fare: jewelry components, charms, a small shell, a piece of a Christmas ornament. Here are things that work in a children's room: party favors, ornaments, small toys... The flip flops were once the decoration on a ponytail holder. Doesn't it look like it should be making Barbie-size bread loaves? This could be part of an aquarium or watercooler. If you're working with a lot of found objects, your priorities may be different when it comes to tools. But chances are, before too long you'll want some! You'll find charms that would look just lovely in a miniature setting, but that have... well, whatever you call those little loopy things that you hang charms by. You'll want to be able to clip wire. You'll find things that could be assembled if only you could drill some holes in them. You'll want to make than single crystal earring into a crystal doorknob or turn other bitty earrings into door knockers or drawer pulls. Making holes has been a challenge, and waylaid some projects. I am not about to get a Dremel tool. I rather fancy this little manual drill. Here are some tutorials for simple minis, using items you very likely do have in a drawer somewhere. My goodness, that hair roller did make a convincing dish rack. Once upon a time, I made a little occasional table from a champagne stopper. Since I don't drink the stuff, I don't come by the little stoppers often. Too bad, there's a lot than can be done with them. 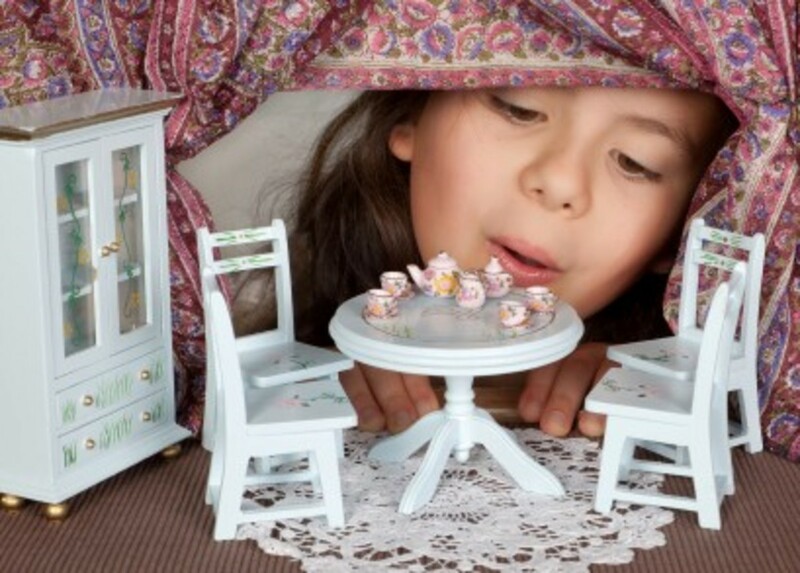 Here are tutorials for several convincing little accessories for a child's dollhouse. Here is a miniaturist to be aware of. Many of the items in the miniature setting are purchased and some are made from scratch. But if you look closely, you tend to find some upcycled or appropriated little objects. 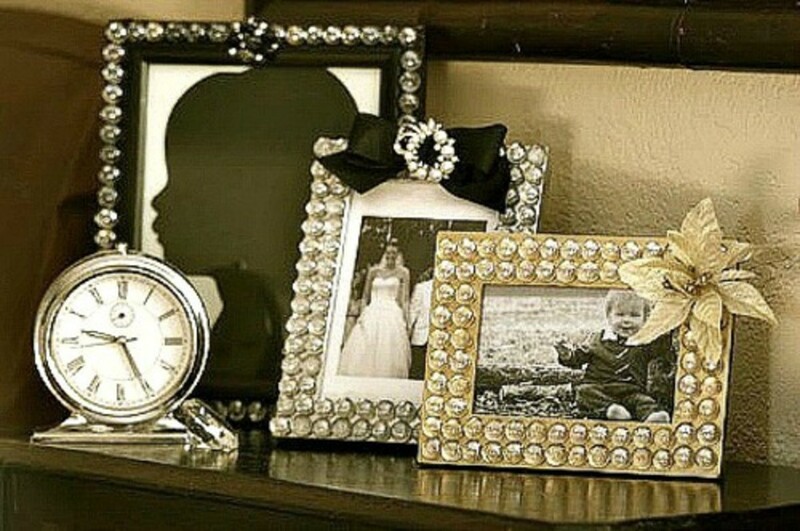 I noticed the little bead creating the vase, and the scrapbook embellishments on the wall. I am curious about the items used to create the chair. That wouldn't be duck tape, would it? I believe the metal pitcher here is actually a bought piece, but little playing pieces from Monopoly sets and other games can be incorporated into miniature settings. Among the treasures here, we find a lost earring, a bitty candle... Some items have been repainted. Bottle caps become pie pans. The white liners inside some lids (Sobo?) become plates. Lids from small or sample-sized toiletries become canisters or pots for potted plants. Pizza toppers become small tables or (when stacked) shelving units. Beads become perfume bottles, ornaments, or vases. Caps (from small markers or small glue containers) become cups. Components used in electrical work may serve in this capacity as well. Single earrings become drawer pulls, door knockers, or door knobs. The center portion of a ballpoint pen becomes a tin/ metal can (which can be used to store miniature pencils or paint brushes). Hooks (from hook-and-eye sets) become clothing hooks. They can be attached to strips of balsa. Bitty found objects don't necessarily take up a lot of space, but they can overrun a place if not organized. I don't have this storage system, but I rather fancy it. You can keep most of the items covered while you work with a few. The cases are rather pretty and can be hung on a hook or stored in plain view on a shelf. 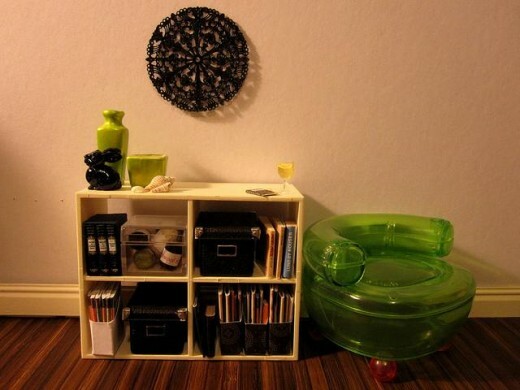 Plus... the right storage makes recyclable tidbits look less like trash and more like the little treasures they are. Any Little Thoughts to Share? Bery inspiring maam,I think I am in right place in a right time!! Awesome, you are a genious &amp; talented. This is inspiring. This would be a great way to teach kids about repurposing and recycling on the "small scale." Neat! What great creative fun for children. I can see them seeking out things all over the house and turning them into functional pieces. Love these ideas. I keep all sorts of tiny things for years and eventually often use them in my artwork. 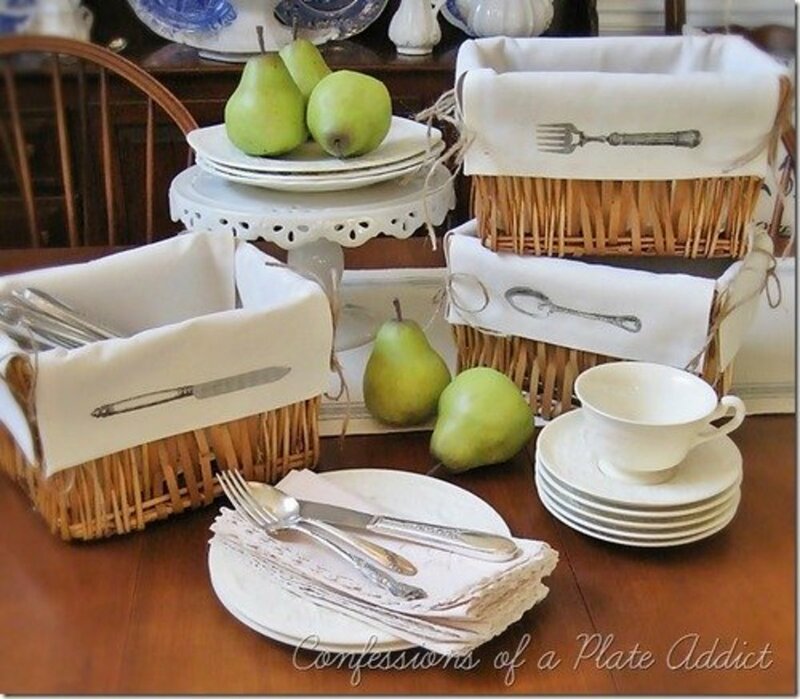 I love any crafts or creative ventures that repurpose, reimagine, reinvent, renew, or recycle common items. Nice to know we don't have to be constrained by age. If it is fun, enjoyable, or stimulating, I say go for it. Congrats on making the reel! Nicely done.